Boston Marathon bombing was meticulously plotted in advance ... by the police! (NaturalNews) Federal, state and local police agencies, along with the various state National Guard forces, have for years war-gamed terrorist attack scenarios. Such preparation is more than prudent, given the scope and severity of the 9/11 attacks, which killed nearly 3,000 people. So it should come as no surprise that virtually all major and mid-sized American cities have been preparing to react to a mock terrorist attack. That includes the city in which the latest terrorist attack occurred: Boston. 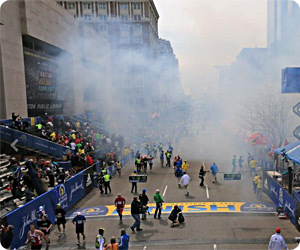 The scenario had been carefully planned: A terrorist group prepared to hurt vast numbers of people around Boston would leave backpacks filled with explosives at Faneuil Hall, the Seaport District, and in other towns, spreading waves of panic and fear. Detectives would have to catch the culprits. ... But two months before the training exercise was to take place, the city was hit with a real terrorist attack executed in a frighteningly similar fashion. "The real thing happened before we were able to execute," an unnamed law enforcement official familiar with the training and preparation told the paper. "We've already been tested." The exercise, dubbed "Operation Urban Shield," had been conducted in 2011 and 2012; this year was to be the third year in a row. Other preparation scenarios included response to a natural disaster or chemical spill. "Last fall, a slew of agencies including Boston police and other police departments, the Coast Guard, and the MBTA joined forces to confront a simulated armed bank robbery in which the robbers were trying to escape with hostages," the Globe reported. One of the goals for this year's training was to test the investigative skills of BPD detectives, as well as their ability to work with detectives in other cities and to share intelligence information. Transit Police Chief Paul MacMillan, whose agency was supposed to participate this year, told the paper that the scenario will likely be kept and the training moved to next early next year. "Why wouldn't we do it?" he said. "Just because we had one event doesn't mean that we might not have another one. And it behooves us to continually work together to investigate these types of incidents." According to the report, officials involved in setting up the exercise had been meeting and planning it for months. Members of a dozen or more agencies met to plan Urban Shield. -- In the training scenario, investigators participating in Urban Shield would have to track down footage of the bombers caught by street surveillance cameras and the phones of "witnesses." -- In the scenario, the terrorists would flee police in stolen cars they would dump in cities outside Boston, which would compel detectives from different jurisdictions to cooperate and share intelligence. -- One major clue would have been the body of one of the terrorists found near a stolen car, dead from a self-inflicted gunshot wound. The hypothetical terrorist group was even given a name: Free America Citizens, a home-grown cadre of militiamen whose logo would be a metal skull wearing an Uncle Sam hat and a furious expression. Why is this important? Because the Obama Administration has identified certain "right wing" groups of citizens - "patriots" and Tea Party members, for instance - as prone to launch such attacks against U.S. government targets and police. "Let me be very clear: We monitor the risks of violent extremism taking root here in the United States," Homeland Security Secretary Janet Napolitano said in 2009, in justifying her agency's recently released report, Right-wing Extremism: Current Economic and Political Climate Fueling Resurgence in Radicalization and Recruitment. "We don't have the luxury of focusing our efforts on one group; we must protect the country from terrorism whether foreign or homegrown and regardless of the ideology that motivates its violence." To date I haven't heard of a DHS-authored report called "Left-wing Extremism: Current Economic and Political Climate Fueling Resurgence in Radicalization and Recruitment" - even though the Unibomber was left-wing, as are the New Black Panthers and President Obama's former "Weathermen" domestic terrorist buddy, Bill Ayers, a former tenured professor at the University of Illinois at Chicago. So much for Napolitano's "we monitor everybody equally" explanation.